Garden Edouard-André of Bourges : An ingenious idea was at the origin of this garden : it was created for the specific pleasure of people with impaired mobility. They can help care for the cold-frames and flower-beds, which are accessible for wheelchairs. 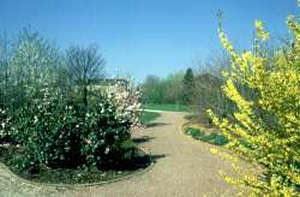 Visitors can admire a unique collection of rare peonies, trees and shrubs. A brief history : Edouard André, a gardener of international repute, was born in Bourges in 1840.